This is a guest post by Aaron Perlut, a founding partner of Elasticity. We work with our fair share of large companies. But as a boutique agency Elasticity is often approached by, and works with, virtually unknown organizations and brands as well. Big or small, they all want the same things — to build brand reputation, become a recognized leader, perhaps sell their new products or services. To accomplish these things, brands need to be willing to do what it takes to break through the clutter of today’s information landscape and do something different, brave, timely or unique. While most initially talk a good game, we oftentimes find the answer is “no,” which may stem from a lack of understanding of what it takes in today’s environment, or an unwillingness to to take risks. But where there is risk — if well calculated — there is reward. Take Budweiser. By now you’ve heard that beginning May 23, its historic brand name will be replaced with “America” on bottles and cans among other changes meant to patriotize the product. Say what you will about the move, which has been widely panned. In my mind, it’s insanely smart. Why? Think about Donald Trump. Yeah, that guy with the orange face and spaghetti squash mane who has miraculously become the presumptive Republication nominee for president. Anheuser-Busch InBev (the makers of Bud) noticed that beyond saying the most batshit crazy things we’ve ever heard from a presidential candidate, Trump vaulted to the top of the heap by embracing the populist passions that were just waiting to explode out of America’s working class — the same audience that drinks Budweiser by the gallon. Theo-conservatives aside, Budweiser smelled an opportunity to jump on Trump’s “Make America Great Again” train and tap into the unbridled nationalist passions by its middle-American core drinker who could care less about latte art and the beer-snobbery that’s driven the craft beer boom. If you are willing to do something different, brave, timely or unique — which is where Bud’s brilliance, in this case, really lies — even if your coffers are small you can develop a creative approach that breaks through the clutter, builds brand awareness and ultimately drives sales. Take Saugatuck Brewing, a craft brewer producing about 15,000 barrels of suds annually in comparison to the 121.9 million barrels Bud produced in 2005. 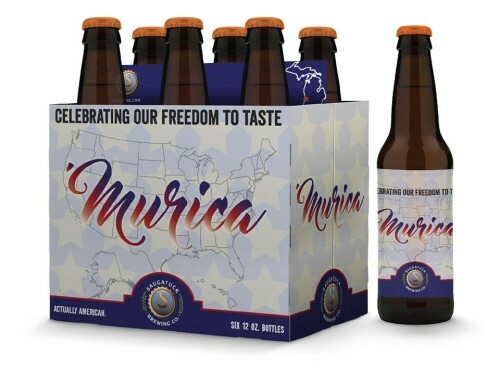 Noting Budweiser’s “America” effort, Saugatuck boldly announced it would begin producing ‘Murica brand beer. Within two hours the post sparked more than 400 reactions, 200 shares and 30 comments — even though the entire thing was a parody. A joke indeed, but well-executed marketing genius as well, whether they knew it or not. Budweiser announced its effort on a Tuesday and by Wednesday the craft brewer launched its parody meant to capitalize on the hype as well as the scorn for Bud. And while Saugatuck’s beers are only distributed in Michigan, Illinois, Ohio, Indiana, Wisconsin and Minnesota — you can bet craft drinkers nationwide are now wondering how they can get their hands on the brewer’s actual products. Brands and organizations of all shapes and sizes are eager to become recognized leaders, sell their new products or services and more. But it in today’s ADHD-laced, hyper-information world, it’s not that simple. You must examine the landscape around you and take a timely, well-calculated creative leap of faith. Aaron Perlut is a founding partner of digital marketing and public relations firm Elasticity.